Boston displayed chemistry we haven't seen in a long time, but is it here to stay? OAKLAND, Calif. -- When talking about his team's inconsistent, disappointing season before Tuesday night's game against the Warriors, Celtics coach Brad Stevens continually brought up one missing factor: togetherness. It doesn't take a body language expert or world-class rhetorical analysis to figure out that something hasn't worked with the Celtics this season, particularly in a stretch after the All-Star break in which they had lost five of six games. Some of it inevitably has fallen on the shoulders of Kyrie Irving, who has reportedly been disengaged from the team for over a month amid free-agency speculation, and recently Celtics guard Jaylen Brown even called the team dynamic "toxic." Stevens broke it down bluntly before the game -- the Celtics had been playing as individuals instead of as a unit. "You are going to have fun in this business if you play well, you feel like you've done your job well, if you've left it all out there together and you feel like you are doing it with a group that is playing as a group -- that's how it works," Stevens said. " ... We haven't played well together for a lot of the year, and that hasn't been something that our guys have run away from." So it was surprising -- shocking even -- that just an hour later, the Celtics were whipping the ball around the perimeter, communicating on defense and dishing out a season-high 38 assists en route to a 128-95 walloping of the defending champs -- the team's worst home loss in the storied Steve Kerr era. This was the same team that had lost five of six? This was the same group that Stevens had condemned before the game for not playing together? If you parachuted into Oracle Arena at pretty much any point on Tuesday night, you would have thought the Celtics were a 70-win team and the favorite to be the Eastern Conference representative in the NBA Finals. Instead, for the past week, journalists and fans alike have written them off due to seemingly unfixable issues. For just a second, you might have thought that the Warriors and Celtics had switched uniforms. 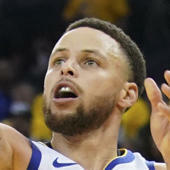 Gone was the trademark ball movement and jaw-dropping skill that has made the Warriors the paragon of basketball for the past several years. Instead their night was marked by horrific defensive lapses, isolation offense and general discontent. It led to a smattering of boos from the Oracle crowd, including a way-too-audible "Play defense for God's sakes!" heckle from one fan who had seen enough. That was the lack of togetherness Stevens was talking about -- only it was happening to the Warriors, not the Celtics. Boston, on the other hand, looked every bit of an NBA title contender, and Stevens even went as far as to hesitantly use a much different "F" word that he has probably been using during the Celtics' recent struggles: fun. "We were very business-like the whole night," Stevens said after the win. "Even at halftime, just now after the game. We know that we haven't played like that enough, but it's encouraging as a reminder that we can. ... Obviously the bench was great. They were celebrating, they were enjoying playing with each other. I guess that's probably 'fun,' as we call it?" The mood in the Celtics locker room wasn't exactly jovial after the game, but there was certainly a sense that the team has begun to exorcise the demons of selfishness that have plagued them on and off throughout the season. Irving credited the team's recent cross-country flight for helping to bring them together. "We needed it," Irving said of the plane ride. "We were gonna get to a point where we were just gonna get tired of fighting each other, fighting the outside world, and it doesn't really matter. So we just wanted to come out here and just play basketball. This is our sanctuary, and we have to do everything to protect it. We can't let anybody infiltrate this." But we've seen this before from these Celtics. Numerous times throughout the season, they seemed poised to rattle off a great stretch of games and re-establish themselves as the world-beater most expected them to be. And each time, they've slipped back into the abyss. Brown stressed after the game the need for consistency, but thinks the team has taken the right steps. "The energy we play with when we play against the best teams in the league is great," Brown said. "The energy we play with when we play against teams that aren't so highly regarded is what we've got to pay attention to. ... I think no matter what, we've got to keep having the right positive mentality. Everybody's got to look in the mirror, and that's what we have been doing. Everybody is just trying to make a positive change and add to the group." It helps that against the Warriors, Boston shot a blistering 51 percent from the field and 41 percent on 3-pointers, and that Gordon Hayward had one of his best games of the season, scoring 30 points on 12-of-16 shooting. But Irving said he told his teammates that they're going to have to maintain that same joy and togetherness when the ball's not going through the hoop, and that will be the true test. It has become apparent with this Celtics group that the camaraderie needs to start off the court and work it's way onto it -- not the other way around. And they have fewer than 20 games left in the regular season to make it work before facing a potentially tumultuous offseason of free agency and Anthony Davis trade rumors. "You step in this locker room, nothing else really should matter," Irving said. "That's a hard thing to come to grips with because it comes with a lot of sacrifice. We're away from our families, you can make every excuse in the book. But here we have a mission that we want to accomplish, and we can't let anyone get in the way of that -- even ourselves."